The S-Line Series redefines the all-in-one design by integrating an EPSON® thermal receipt printer into a touchcomputer. Its compact design allows easy setup (watch video), and will save precious counter space, reduce cable clutter, last but not least, generate additional revenue. The S-Line can load the most commonly used paper size: 80mm (3 1/8") wide by 80mm (3 1/8") diameter. The printer has a quiet operation and prints a fast 250mm (9.8") per second. It has an auto-cutter which will help reduce paper jams. Replacing the paper is very easy, and works just like any standard thermal printer. The most exciting feature of the S-Line is the printer's patented tool-less "slider" design. It allows the printer to be easily replaced in the field in about a couple minutes (watch video). 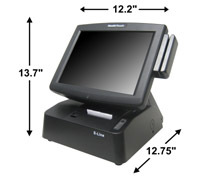 The M2 S-Line stands 14" tall and 12" wide , and will free up the space beside your POS terminal by eliminating the need of an external printer. You can now use this space to generate additional revenue by displaying advertisements or selling merchandise. The S-Line can also be strategically placed in a store as a Point-of-Information or Self-Check-Out kiosk to provide convenience and improve customer satisfaction. Additionally, the M2 S-Line will help conserve electrical energy in many ways. Since it powers its printer internally, it eliminates the need for an additional power brick. The M2 S-Line further boosts energy efficiency by utilizing an LED-backlit LCD which requires less power than a traditional LCD. For processing data, the M2 is powered by Intel's Atom processor which consumes less power without sacrificing performance. The M2 S-Line runs most Windows operating systems, and offers a wide range of integrated peripherals, such as magnetic stripe reader, biometric reader, barcode scanner, and secondary display. Expandability includes Intel Gigabit network, 4 Serial, 6 USB, poweredUSB +12V and +24V. 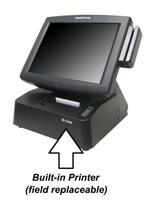 Ideal for retail/restaurant/bar/quick service point-of-sale, point-of-purchase, self-ordering kiosk, and queue management. Paper Width : 80mm / 3.125", Diameter : 80mm / 3.125"
Intel Gigabit network, 4 Serials, 6 USB, poweredUSB (12V and 24V), ext.VGA.